What is new in TachoWeb? TachoWeb 6.0 – What is new? 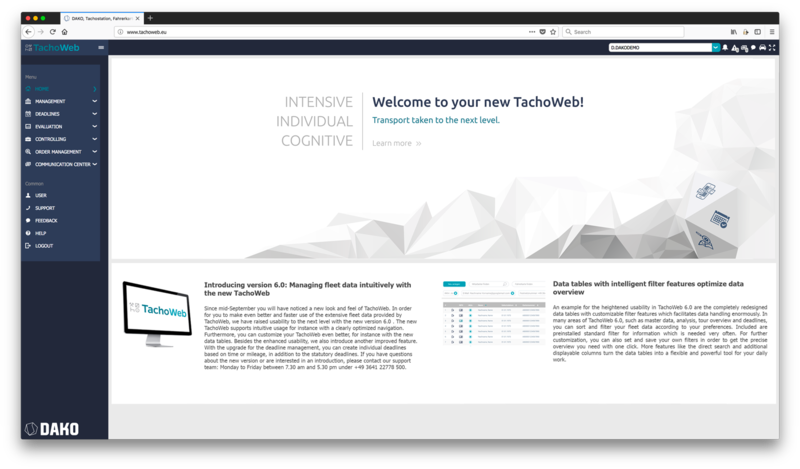 We are delighted and proud to present to you the new TachoWeb. We have redesigned the platform fundamentally, with attention to detail and our passion for intelligent transport management. With the new version, you’ll be able to manage your fleet even faster and more intuitive. In order to make the transition as smooth as possible, we summarized the elementary changes of the interface here for you. The login is now located in the middle of the content area, not on the left side anymore. We have reduced the different login boxes (administrator, user) to one single entry box, where all users can log in. You enter your company ID or your company code into the box “account name”. The box “user” should contain your user name (in case of administrator login, the box remains empty), and in the last field you enter your password. You’ll find the main menu now on the left side of the screen, not on top as before. The second level navigation is located there as well. Thus, the navigation is located in one place, following the user’s gaze. The navigation path is highlighted clearly (in the menu as well as on top of the content area, e.g. “Management / Master data / Employees”) in order to enable an optimal orientation on the portal. Furthermore, the main menu is foldable by clicking the menu icon on the upper left. The bar then only shows the icons of the main menu in order to still provide the necessary orientation. At the same time, the content area – your work area – is expanded. The fullscreen mode now provides a better overview. To switch to fullscreen click the button on the upper right corner in the bar where the company code box is located. 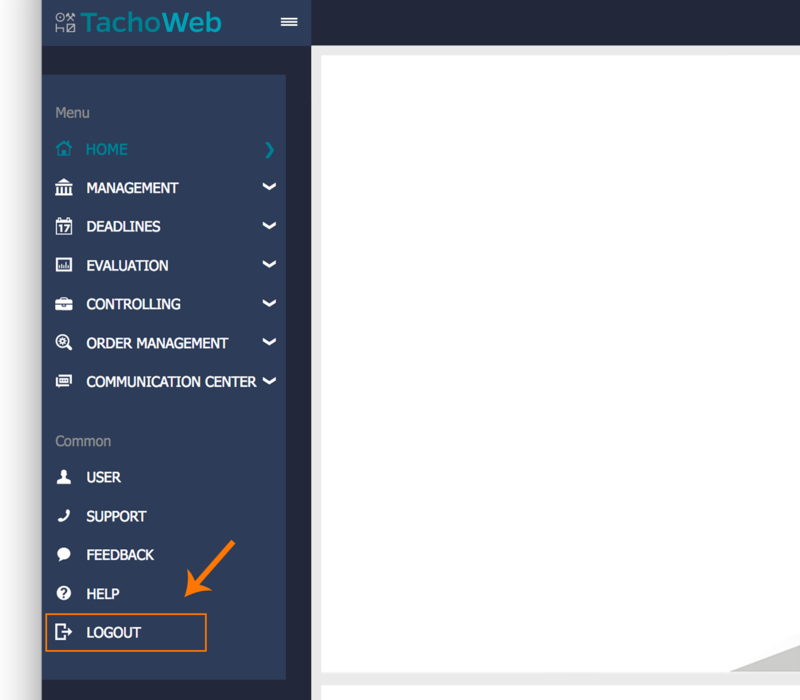 Use TachoWeb in the way which is most efficient for you! General topics like contacting support, giving feedback or the user menu have been pooled together in one place on the left menu bar. Here, you’ll find also the logout button on the bottom. You can still use TachoWeb in one of 17 languages. To change to your favorite language, go to the menu item “user”. Here, you can also change your password. Download requests for reports, exports and tasks are collected in the upper task bar, marked with the bell symbol. Thus, you can continue working with TachoWeb while your downloads runs parallel. With this basic guide we want to help you using the new TachoWeb interface. 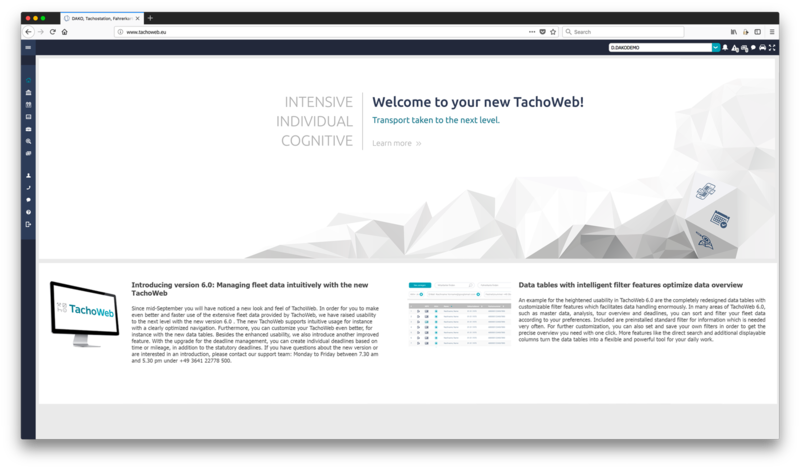 Of course we developed also other new features and optimized the platform structure further for the new TachoWeb version 6.0. 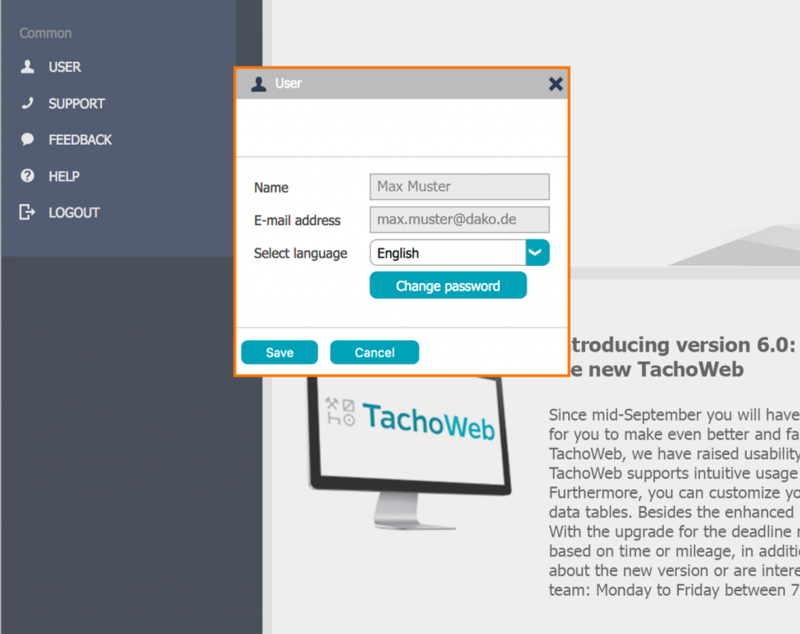 You can find information about that on your TachoWeb home page, where we introduce new features continuously. You have questions or need more information? Please don’t hesitate to contact our DAKO team under +49 3641 22778 500 (Mo-Fr, 7:30 am – 5:30 pm).